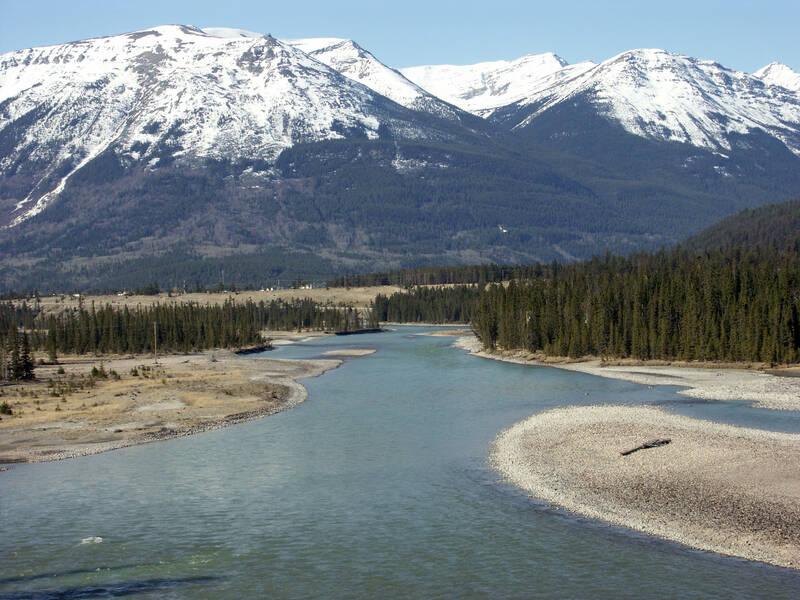 The Athabasca River begins at the Columbia Glacier in Jasper National Park (headwaters) and travels about 1500 km northeast across Alberta and drains into Lake Athabasca in the north-east. Lake Athabasca flows into the Slave River and joins the McKenzie River, which eventually flows to the Arctic Ocean, travelling over 1230 kms from start to glacier to mouth. As the Athabasca River flows, it also goes through a tremendous change in elevation; from 1062 metres at Jasper to about 205 metres at its mouth in Lake Athabasca. The entire Athabasca river basin is approximately 159,000 square kilometers, which is about 24% of Alberta's landmass. It is fed by ten smaller watersheds or sub-watersheds that eventually flow into the Athabasca River (McLeod, Pembina, La Biche, Lesser Slave, Clearwater). The Athabasca River is the second largest river in Alberta, and the largest undammed river. The mean annual discharges in cubic decameters (dam3 = 1000 cubic meters) at points along the river are: 2,790,000 dam³ at Jasper; 13,600,000 dam³ at Athabasca; and 20,860,000 dam³ at Fort McMurray. The confluence of the Peace and Athabasca Rivers with Lake Athabasca in the north forms a vast wetland called the Peace-Athabasca delta. It is one of the world’s most ecologically significant wetlands and has been designated as a Ramsar Convention wetland and a United Nations Education, Scientific and Cultural Organization (UNESCO) World Heritage Site. It is recognized internationally as an important habitat for nesting and a staging ground for the migration of waterfowl, including the threatened whooping crane. It is also a habitat for the native wood and imported Plains Bison. The ecology of the Athabasca river basin is diverse as a result of the different natural regions within its watershed. Ecology refers to the inter-relationships between living organisms (plants, fungi, microorganisms, and animals (including humans) and their non-living environment (air, rocks/minerals/soil, water, weather/climate). There are four natural regions in the Athabasca watershed: Rocky Mountain, Foothills, Boreal Forest, and Canadian Shield. The central and lower areas are mainly Boreal Forest while the upper region includes foothills and Rocky Mountains. A very small area of Canadian Shield natural region is situated north of Fort Chipewyan. The Athabasca River is an historic waterway for First Nations peoples and the fur trade. The Sekani, Shuswap, Kootenay, Salish, Stoney and Cree tribes hunted and fished along the river prior to European colonization. From about 1778, the Athabasca River was a key part of the main fur trade route from the Mackenzie River to the Great Lakes. The Athabasca river basin is physically and ecologically diverse. The region is endowed with many natural resources, including forests, coal, oil and gas, minerals, agricultural and, of course, oilsands. The development of natural resource industries results in specific land uses that influence surface water and groundwater quality. They also affect settlements and a growing diversity of people who live along the river, adding to the demands of the land and the river. In 2001, the Athabasca river basin supported a population of 154,097 people, or 5% of the provincial population. This includes all or parts of 22 rural or regional municipalities, one city, 12 towns and 14 Aboriginal settlements. Human development activities in the Athabasca river basin have generated some major environmental concerns. Economic activity in the upper portion of the watershed is dominated by forestry, agriculture, and tourism as well as three active coal mines and one closed. There are five pulp and paper mills in the upper half of the watershed. Forestry occurs throughout the river basin, while oil sands developments dominate the lower portion. A growing number of municipal wastewater treatment plants discharge into the Athabasca River. Unmanaged recreational activities are increasingly causing stress in several areas of the watershed. The total allocation of surface and groundwater in the watershed in 2005 was 849,639 dam3. In 2005, the petroleum sector uses accounted for 68 % and other industrial sectors accounted for another 17 % of total allocations. Municipal (7%) and other sectors (5%) accounted for most of the remaining allocations. Only by examining the accumulated effects of all of the activities and stresses upon the entire length of the Athabasca River Basin can we properly appreciate and plan for the sustainability of this vital waterway.